I picked up what I think is a transitional surplus 85 made in 1991 a couple days ago, and I'm having a hard time telling if it's all original and what parts were used. Here's a couple pictures of the outside. The safety doesn't have the service hole I've seen mentioned on the old style safety, but it has the old style staked front sight. Stranger yet, it has an adjustable "combat" trigger. Is this something CZ normally made for a while? I thought the adjustable trigger was exclusive to the Combat, but the Combats all had adjustable sights as well. One big thing I'm wondering is if the safety likely is the one notorious for flying apart and having a microscopic spring that disappears at the drop of a hat and you have to wrestle with to get back in. Does anyone have comparison pictures of the two types? If not, I can pop it open and take a picture, although the lighting in my house is terrible so it might be at an odd angle. The magazine release is also surprisingly stiff, which makes me wonder if the spring was replaced semi-recently, or if the screw being overtightened can cause trouble with it. Should I try backing out the screw a tiny bit or should I just mash the release a few hundred times and see if that starts to loosen it up? you should know that depending on how CZ mfg things it could be just made that way. 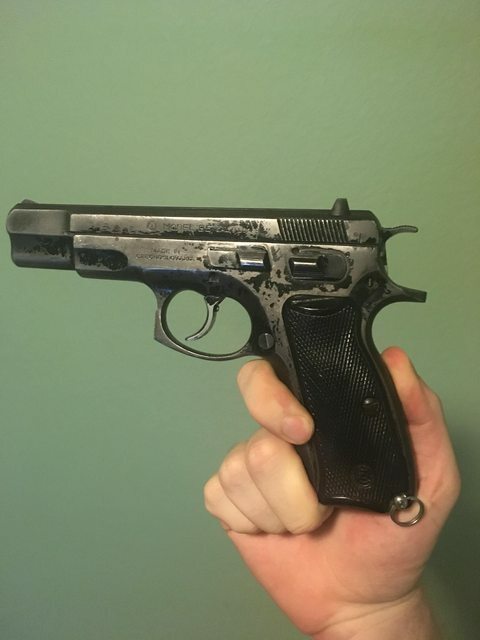 Colt used "bins" to hold parts and as you can imagine, if some part such as an adjustable trigger got tossed into the non adjustable trigger bin, thats a possibility how it ended up on your CZ. Colt also "cleaned up" leftover parts too. Parts are not free, so they used up what they could. Also, you dont know the history after the gun left the factory. If it was a service gun or range toy for someone? for example, the various US Military surplus guns are seldom found "Original" since they were used (alot?) and were eventually "rebuilt" at some point in their life. with the lanyard on the grip, it may have been a Law Enforcement gun or military service pistol. It appears that the gun has been holstered somewhat and that maybe it hasnt been used alto based off the grips, but grips can be swapped. if the s/n matches on the lower/upper/barrel, then i would say its "correct"
This was an import from DWJ, formerly CDI, so it was military and I'm guessing Israeli since as I understand it that's where they get a lot of their imports. Serial matches on upper, lower, and barrel, actually. Going off of the videos and an exploded parts diagram, it looks like the later version, which would be fantastic both because it's less terrible to disassemble and because it's easier to find a replacement if I need to. I'm still going to take it apart in either a gallon ziploc bag or an empty cardboard box with the lid mostly closed. That looks like a transitional, to me. It has a later frame, with an early style slide, meaning no FPB and staked front sight, and spur hammer. Transitionals are al over the map. You have a 'new' style slide by the slanted serrations. No FPB and a staked sight. Odd for the staked sight. Bummer. Your safety - if no service hole, it MUST be a new style. To confirm, look in the frame right inside of the safety and you should see a spring loaded plunger JUST like a B model. So essentially you have a B frame, but the sear cage has no lifter. So, you can easily take down the frame like a B and NO problem with flying detent/spring on the inside of the actual safety lever. Find a video for the B detail strip and you will have it. Thanks, I’ll give it a shot when it’s time to do a full disassembly. I’m extremely happy that the safeties are the new style. Can you tell if the same is true of the slide releases? Does the rear dovetail look like the old size or new size? I can’t tell by eye. Before last week I had no idea about all the generational differences. Based on the year, the slide release would be the smaller diameter on the right side. My 96 dated Combat has that style. The large diameter was much later. I find it interesting that CZ changed things on the slide in a piecemeal fashion...new style serrations with a staked sight. You'd think they'd make those changes all at the same time due to casting expense. They always keep you guessing. Thanks. I guess that means the slide release is going to be a PITA to replace if necessary. At least my thumbs reach it just fine thanks to the gigantic hands pictured above. The safety is proving to be difficult to reinstall, is there a secret aside from squeeze hard? I’m afraid of breaking something, even though it seems like the detent is out of the way. I’m having a hard time finding a video, I’m only seeing ones for the SP-01 and one where the 85 is out of frame half the time. 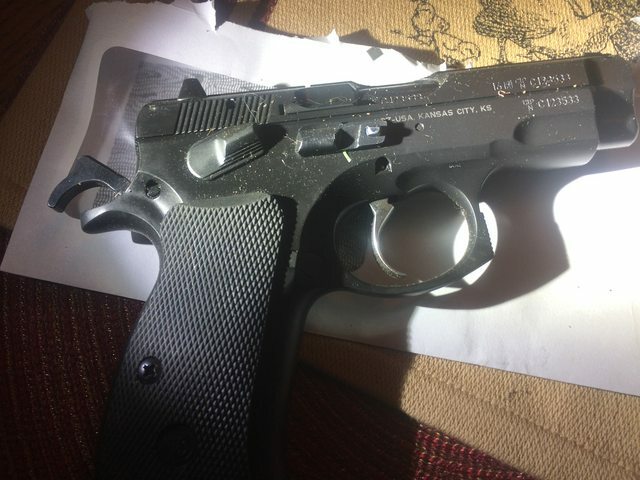 It seems like the gun was loaded and unloaded a lot more than it was shot, it could use a bit more polishing on the trigger bar, but the top bits that contact the slide are mirror finish. The top magazine brake pin is MIA, does anyone have the diameter? I don’t want to have to order just that from CZ Custom, and I was planning on getting the hammer spring and FP kit from CGW, but CGW doesn’t have the pin in stock. I was thinking about just going to Ace Hardware and using snips or diagonal cutters to snip a pin to fit. Let me know if this should start going in the gunsmithing section at this point. I also need to pick up some punches from HF, my screwdriver bits that I have used to push pins before aren’t really working on this. I’ll probably also pick up some high grit sandpaper and jeweler’s rouge too. To reinstall the safety...Install the R/H side first. You need to lift the leg of the sear spring so it will clear the shaft and enter the notch. I've never had any issues with the detent. Then insert the left side, and once again, lift the leg of the sear spring. You might want to place a short section of spray nozzle tube over the leg to help you manipulate it. Try not to bend it. I don't have the pin diameter. Thanks, I got it. There’s a video for a NZ-85B out there that helped, I had to pull the detent back to get it the rest of the way on each side. Now to pick up some sandpaper and polishing compound and do it again. I think you have a Transitional 85, period. At one time, all 85's (Lux, Combat. etc.) had the overtravel screw. One of the previous posters mentioned the "parts gun" phenomenon. CZ did this big time from '89-'92. 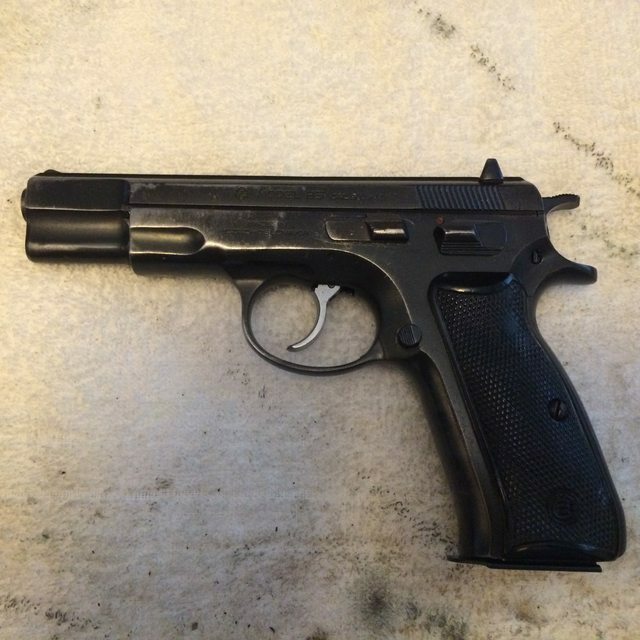 Looks like my Pre B CZ85 (safeties). The frame can be drilled out for the newer right side slide release if yours breaks. Easy to do. The frame, on that side, is divided. You don't have to drill all the way through both sections. Just far enough into it (just a few thousandths over 0.250 inches = the OD of the newer right slide release in diameter and keep trying to insert it till if goes in and pivots/rotates without dragging. Mine as purchased. Mine has the same front sight (tenon goes through the barrel bushing to hold it in and then has to be staked). I used a 1911 replacement front sight and had to modify the tenon shape to make it fit. I bought and "original" Pre B sight and the size/shape of the tenon wasn't even close to the size/shape of the hole in the slide/barrel bushing. The replacement rear sight worked like a champ though. After. I just like that two tone look. Primary Machine did the cerakote work on the frame, slide, controls and barrel. I carried it daily for a few months (open carry, drop leg holster) when I was out with the dogs or working around the yard/garage. Then I got the urge for a CZ85 Compact. 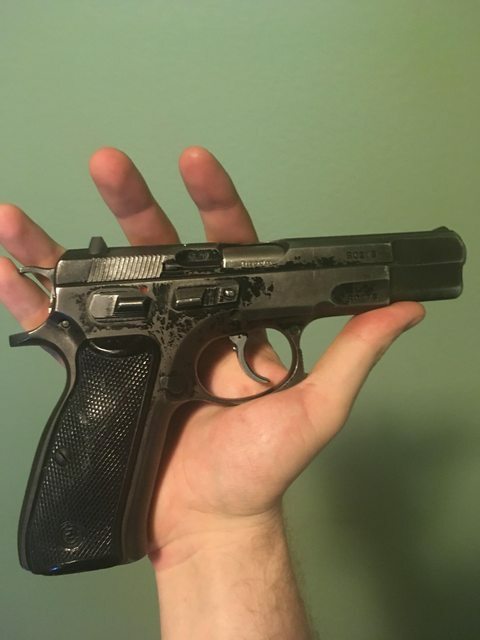 Since CZ doesn't make one I had to buy a CZ75 Compact and do the measuring/drilling/fitting for the CZ85 safeties/slide release and hammer. 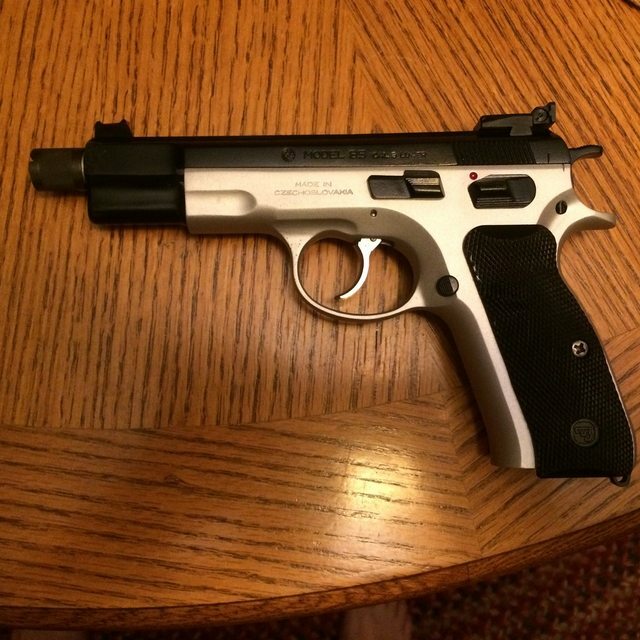 I carried that one (concealed and open carry for a couple years before going to a P01 Omega. See what I mean about installing the right side slide release. If you don't/won't/can't do it I'd think you could find a gun smith that could to it, if your right side slide release ever breaks. Just noticed that scratch looking place on the picture under the slide release. Not sure what it is, but it's not a scratch. Hmm. heres an similar 85 to yours. No lanyard ring. For what it's worth, I just googled Pre B CZ85's and clicked on images. Lots of CZ75, and other CZ models and even non CZ guns. But, if the picture showed the right side of the pistol and it was a CZ85 then it had the same type of safeties your pistol and mine have. Any where I could read "CZ85" on the left side of the slide also had the same type of safeties.